Let me just start by saying, I have a lot of feelings about this year's Golden Globes red carpet, and that's a good thing. It feels like for the past few years, it's been a parade of snooze-worthy mermaid hems with a diamond in the rough here and there. Sunday night's festivities were full of interesting choices from almost everyone—for better and for worse. I can happily say that there weren't that many strapless dresses, and Let's get into it, shall we? Click through for gigantic photos, lots of thoughts and feelings and all my best-dressed picks from Emma Watson to Lupita Nyong'o and Margot Robbie. Choosing my very best dressed is a toss up between a few ladies who absolutely killed it in red. If white was last year's color of the season for the carpet, crimson is in the running this time around. I absolutely adored Emma Watson's top and pants pairing from Dior Haute Couture. She just never ceases to nail it, and this risky choice is something not many of these ladies could pull off. Everything about this is what makes me love awards season. And fashion. And pants. Surprise pants. 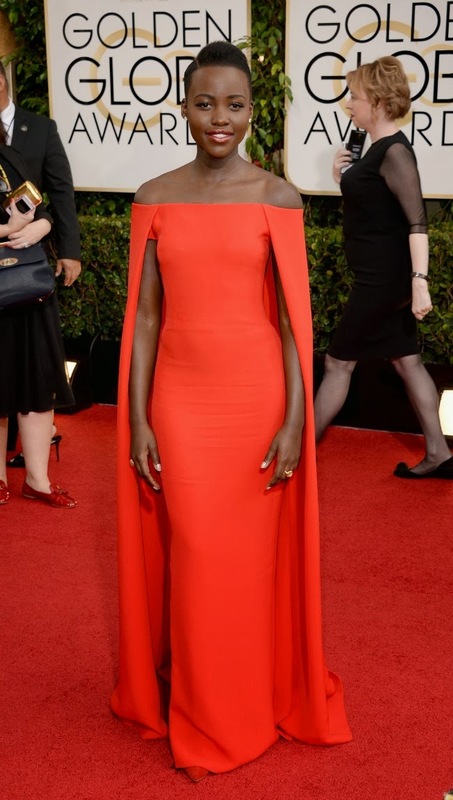 Additionally, newcomer Lupita Nyong'o has decided from day one to just kill it. She's been popping up here and there for 12 Years A Slave in completely stunning looks, and this Ralph Lauren dress is just like, damn. Right? I know Gwyneth was sitting there like I ALREADY DID THAT, but still. Red. Cape. Yes. Oh heyyyyy Elisabeth Moss! How great does she look? I am almost always into a dress with a crew neck and cap sleeves, I find the combination so appealing on a glitzy gown, and this is definitely glitzy. However, the dark burgundy and black color palette makes this more chic than showy. Another newcomer who's yet to miss a beat is The Wolf of Wall Street's Margot Robbie. This Gucci gown fits her like a dream, and I love that her only jewelry is sparkling earrings and a major pinky ring. I can tell under that slit that there's a serious platform on those shoes, which I hate, but I'll let it slide for the pure winning status of this dress. Now, I know this might be a controversial choice, but I kind of love this Fausto Puglisi dress on Rashida Jones. It's a more fanciful and conservative embellished white dress than Robbie's, above, but I can dig it. The palm trees are fun, her hair is so cute (I love a good "kiki bun" and for once her bangs aren't insanely greasy and piecey) and the only thing I'd change is the belt. She looks fashionable and cute and gorgeous. Can I tell you that I squealed when Robin Wright won her Golden Globe for Best Actress in a Television Drama? I have loved her since The Princess Bride (haven't we all? ), and to say that she's good in House of Cards would be the understatement of the year. Her icy, powerful character Clare Underwood is terrifying and impressive and stunning—and she looks incredible in this champagne backless gown. Kate Mara makes almost unfailingly chic red carpet choices. I love this silver J. Mendel gown, especially it's structured shoulders and plunging neckline. The differing textures make it interesting and unexpected. Also, that ring. One noticeable trend on the Golden Globes red carpet? Being pregnant. Kerry Washington, Drew Barrymore and Olivia Wilde all took a turn proudly showing their baby bumps, but if you ask me, only Olivia did it right. Her fitted Gucci sequins and long, loose waves look easy and lovely. We can all only hope to look this good when we're expecting... Jeeze. Two more winners in my book include Cate Blanchett in Armani and Julianna Margulies in Andrew Gn. I love the cut of both of these dresses, as well as their dramatic detailing. 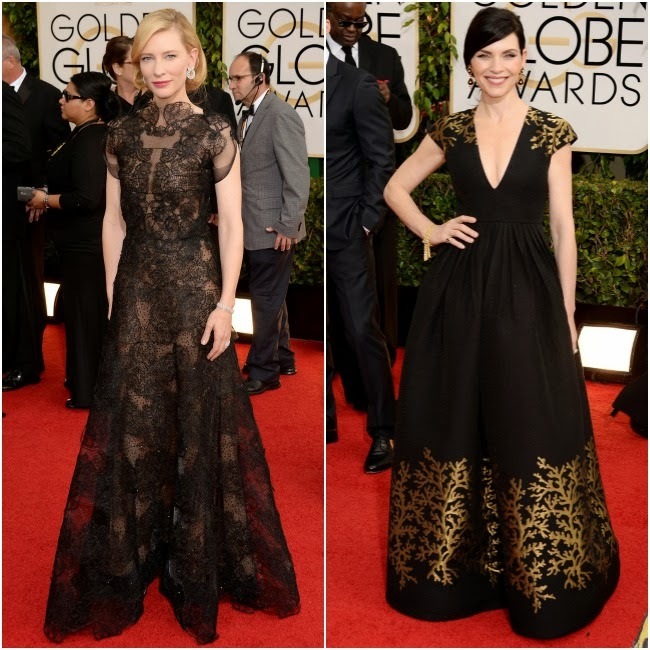 Cate's intricate lace and Julianna's gold coral embroidery are both so so pretty. *Updated: And finally, Gwyneth Paltrow. She made a sneaky appearance with Chris Martin, and didn't do the red carpet. This mini is unexpected for sure, and honestly I was hoping for better. This dress gets a "meh" from me. Who were your picks for best dressed at the 2014 Golden Globes? Let's discuss! just slightly disappointed with gwyneth as well. maybe if the dress was slightly more fitted it would be better? i'm digging the *idea* of the mini but not the execution. haha i thought the exact same thing about the red RL cape dress in regards to gwyneth's white tom ford last year... so funny. i still think the red RL was one of the best of the night. also love rashida's... how did i miss that? !